I kinda hate to post this one, cuz now the secret is out...the guy in the stern really doesn't work very hard. 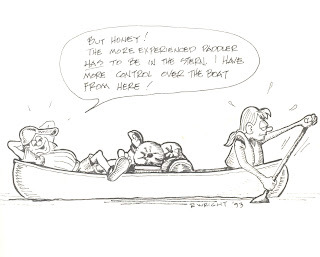 I am sure we are important, as the cartoon states, we have all the control of the boat from back there. But we certainly don't work very hard!! This toon obviously has some self portrait similarities, only this one includes my honey, who has faithfully paddled the front position for years. By God!! She sure keeps my boat moving forward! !